In a world of ever increasing pollution and climate warming there is an immediate need to understand how physical processes in our lakes affect the aquatic environment. In particular, we are interested to correlate the evolution of bio-chemical processes, and water quality in general, with the water circulation and temperature in the water columns of our lakes. To better understand the temperature variability experienced by coastal embayments in the Laurentian Great Lakes, at the Department of Physical and Environmental Sciences at University of Toronto Scarborough, we performed a focused study of water temperatures, water level oscillations and current profiling in the various embayments within Toronto Harbour, during the ice-free season of 2013. Toronto Harbour is a large and complex embayment system (18 square km) located on the northern shore of Lake Ontario at 43° 38′ N, 79° 22′ W . The Harbour has a mean depth of 10 m and consists of a commercial port and several natural and artificial embayments used for recreational purposes. Most large harbours in the Great Lakes are dredged to similar minimum depths corresponding to the minimum “Seawaymax” draft of 7.92 m for the large freight ships using the St. Lawrence Seaway. 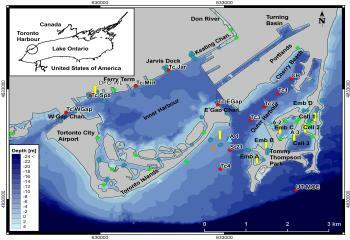 Hence, many of the general features of Toronto Harbour are similar to many others ports in the Great Lakes and we expect that many of the features of temperature variability in this harbour to be of general relevance to large embayment systems throughout the Great Lakes. Despite the economic and environmental importance of Toronto Harbour, there are only a few previous studies that describe the physical processes driving water movements and temperature variability (e.g., Haffner et al., 1982; Dewey 2012; Murphy et al., 2012). The observations of Murphy et al. (2012) described how cold upwelling events in Lake Ontario caused corresponding drops in water temperature in the more exposed embayments of Toronto Harbour, but they noted that the shallowest embayments were largely unaffected, and provided valuable habitat for warm-water fishes. Some shallow protected embayments can reach 30°C in the summer, typical of wetlands, while more exposed areas have maximum temperatures of 15-20°C near the surface, and <10°C below the thermocline (Haffner et al., 1982; Murphy et al., 2011). A brief explanation of physical processes in Lake Ontario and a description of my research done in Toronto Harbour can be found following the links on the right side panel.